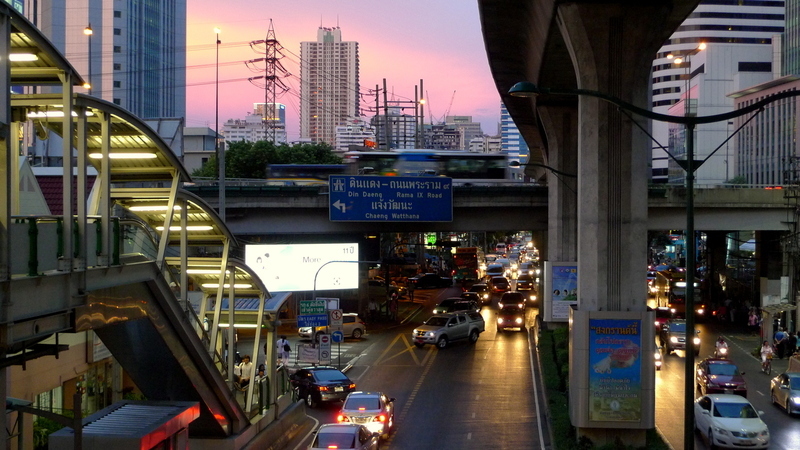 Yesterday evening I finished a meeting over by Ploenchit BTS station just after sunset. The sky was a beautiful color – particularly pink in the east – and I stopped to take some pictures that turned out rather nice. I thought I’d share them with you. The first thing I noticed was the pink sky in the east, a reflection of the setting sun in the towering clouds on that side of the metropolitan area. 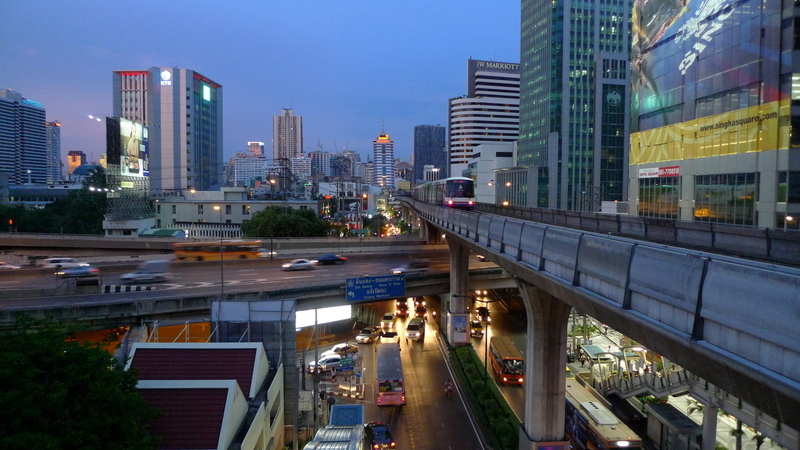 This view is looking along Ploenchit Road, which turns into Sukhuvmit Road as soon as it crosses beneath that expressway. The Skytrain line runs down the middle of the street and the next station is Nana. Traffic is still pretty light after the new year holiday last weekend. Turning around and looking northwest, you can see Wave Place on the left and a new condo, both of which face Witthayu (Wireless) Road. The pink sky in the east is reflected in the windows of Wave Place. Immediately to the right of the condo, just poking out the right side of it, is the Baiyoke 2 Tower, the tallest building in Thailand. The LED lights at the top are showing a Thai flag: red, white, blue, white, and red stripes in that order. 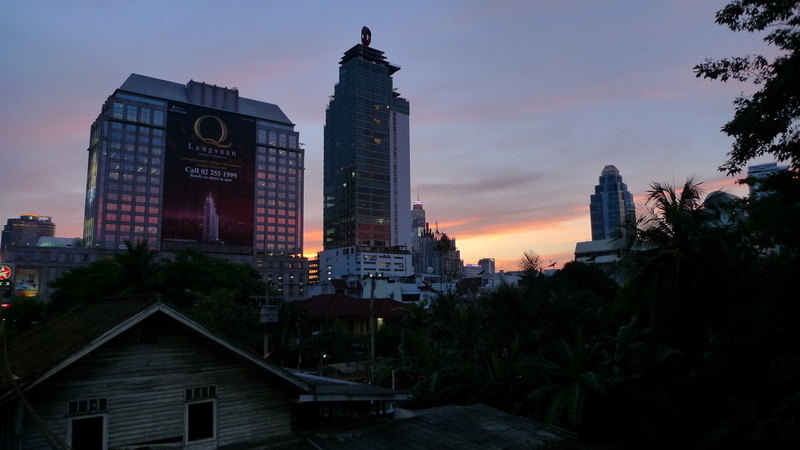 In the foreground is one of the remaining old properties that lie along Ploenchit Road, holdouts against the development that is taking over this area. A few minutes later I climb up to the Skytrain station platform and take another picture looking east. The pink sky is gone and it is actually dark purple at this point. But because I used an exposure of about 1/13 of a second, the sky’s color appears lighter. 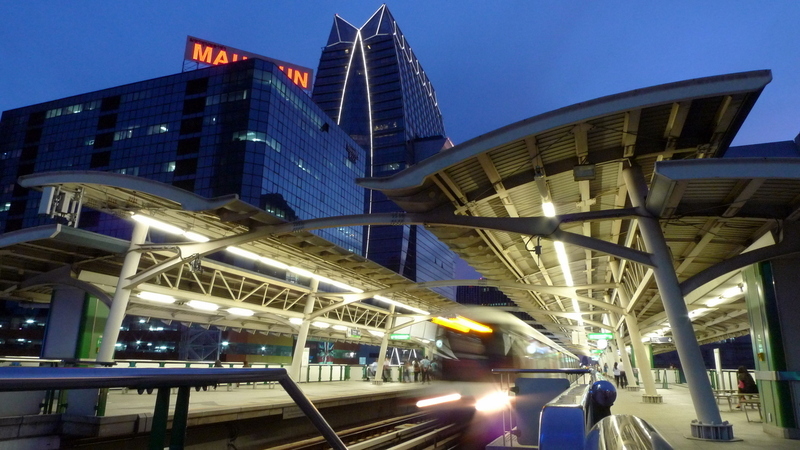 Looking due west, you can see a train departing Ploenchit station for Nana. Behind it is Mahatun Plaza, one of the older office buildings in this area, and the brand-new Park Ventures tower, about which I wrote yesterday. The side-view of the building is meant to evoke the wai – the polite Thai gesture of greeting where the palms of the hands are placed together, fingers points skyward. This entry was posted in Uncategorized and tagged Bangkok, BTS, Cityscape, Ploenchit, Skyline, Skytrain, Sukhumvit, sunset by christao408. Bookmark the permalink. If I didn’t know, these could be of nearly any city scape (but cleaner and more modern). I do like the artistic quality of the photos – especially the reflection of the sunset in the windows. Wow that is pretty!Miss Thailand and the both of you!!! Sometimes I miss big cities, sometimes I don’t. Nice to see clear skies in BKK. I miss roaming around the city! These are beautiful shots, Chris — the Golden Hour at its best! I love it when the sky produces such beautiful colors. Beautiful shots – I love the play of light and dark. OK, I need to get some of the sunset at the beach – mea culpa. You can feel the heat of the city coming through the pics. The architecture is driving me crazy! How cool are your photos and your cooking…devine. you are soooo awesome. Brautiful pictures Chris. Sunsets are always such a delight to behold when the colors are this spectacular and reflect in the buildings. I love that magical hour of dusk. I like how you contrast the peaceful sky with the bustling traffic and trains. Wow, some days I really miss Bangkok. Thanks for all your comments! @ElusiveWords - @ZSA_MD - @slmret - Sunset is a spectacular time for picture-taking, isn’t it? @marc11864 - Yes, as soon as the sun starts going down the city starts to look a lot better. @SistahWarhol - Thank you very much. I’m so glad you enjoy this blog. @UncCharlie - Now, see, it is interesting what we project onto the photos. That evening was actually very breezy and because of that the temperatures were not too bad and it was very pleasant. In fact, it were those breezes that invited me to linger in this area longer than I might otherwise have! @Fatcat723 - Yes, let’s see some sunset shots from your neck of the woods! @beowulf222 - Really pretty, isn’t it? @CurryPuffy - Thanks to the strong winds, it was actually very clear that evening. One of these evenings when the weather is like that, I want to go to the Baiyoke 2 tower during sunset. @Randy7777 - They are certainly photogenic, but the photos often belie all of the pollution, busyness, and congestion that cities contain. @yang1815 - Miss you, too. Looking forward to Maui. @murisopsis - So glad you enjoyed them. Yes, there are many aspects of these pictures that make Bangkok look much like anywhere else. In some ways, global cities are becoming more similar than dissimilar. Nice pics. It’s so opposite of the next post on organic farming. The stairs going up and down and the trains above ground have this very futuristic feel. @brooklyn2028 – That’s Bangkok – very futuristic! Ha ha… As for the choice of stories, I try to mix it up a little so there’s always something new and interesting.